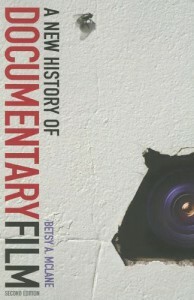 The University Press of Kentucky, 2007 By Betsy A. McLane, Ph.D. Note: although 3-D and Stereoscopic are different, for purposes of this review the terms are used interchangeably. The famous Lumiere Brothers L’ARRIVE du TRAIN, an iconic film, which, shot originally with one of the first motion picture cameras, startled 1895 audiences with its 2-D image of a locomotive rushing toward them. What most film histories leave out is that the Lumiere Brothers were trying to achieve a 3-D image even prior to this first-ever public exhibition of motion pictures. As early as 1800 they patented an “Octagonal Disc Stereo Device” meant to shoot for 3-D projection. Although Zone cites dispute about its production date, Louis Lumiere eventually reshot L’ ARRIVE du TRAIN in 3-D and exhibited it at a 1935 meeting of the French Academy of Science. This and other 3-D tidbits are cited in some film history books, which most of which have fallen out of favor (i.e. James Limbacher’s once mandatory FOUR ASPECTS OF THE FILM, 1969). It is to Zone’s credit that he carefully compares such existing texts to each other and to his own findings, making clear the contradictory accounts that plague early cinema and pre-cinema accounts. Greg Toland’s justly famous deep focus cinematography was clearly linked to his fascination with 3-D. He shot test footage using a device built by William Alder of Cal Tech that attached to a regular camera. The results were shown to no less a personage than Samuel Goldwyn on the giant screen at Grauman’s Chinese Theatre. Although impressive, the experiment yielded no commercial follow-up. Toland outlined the artistic problems of lighting, camera work and editing for 3-D in a 1935 article published in THE NEW YORK TIMES. His interest in creating a 3-D experience seems obviously linked to his masterwork in many films, including, most famously, CITIZEN KANE. These examples are only two of the delicious surprises that await readers of STEREOSCOPIC CINEMA. Zone traces 3-D history, not strictly chronologically, but through well-chosen themes such as “Cinema’s Novelty Period”, “Public Exhibition” and “Stereoscopic Cinema Proves Itself.” He allows readers to draw their own conclusions from a myriad of facts, diagrams and quotations from patent applications. My own few quibbles include the lack of space given to the influence of military applications. Although he mentions Nazi use of a stereoscopic system, and the training applications of 3-D used by the US Navy during WWII, the politics and funding for the development of these technologies is not explored. The detail of the lists and old diagrams of patents sometimes become a bit technical. For readers interested in the more human or sociological implications of 3-D, some of the lists grow long. Without these, however, the book would not have its compelling power. Also the many aesthetic issues raised by 3-D are addressed only peripherally, and problems of editing in these formidable formats are scarcely mentioned. I am sure that Zone has much to say about these and other artistic concerns, but STEREOSCOPIC CINEMA is, admirably, a work of fact, not opinion. Other writers should be inspired to explore these and the many other issues raised by Zone’s work. Every section contains fascinating nuggets that underline the genius and perseverance of inventors from Europe, the UK as well as the US, traits that provided a continuous impetus for 3-D exploration. Russians too, took the plunge, and were perhaps more fully successful than others. Semyon Ivanov used an autostereoscopic system to complete a version of ROBINSON CRUSOE on 70mm in 1941, in the midst of WWII. It, along with other pictures, played in Moscow’s specially constructed 180 seat STEREOKINO THEATRE for 18 years. Four additional STEREOKINO houses were eventually built in the Soviet Union. As a result no one less than Sergei Eisenstein stated, “To doubt that stereoscopic cinema has its tomorrows, is as na?ve as doubting whether there will be tomorrows at all.” Hopefully Ray Zone will document many of those tomorrows in a successor volume that continues the magical story of 3-D cinema. © 2008 Betsy A. McLane, Ph.D.